My maternal grandpa, Debs Warren Webster, was a dentist. He was born in Brazil and was the son of my great-grandfather, Watson (Frederick) Emory Webster, who was also a dentist, and who I refer to as "The Traveling Dentist" here on my blog. My Grandpa Debs, Grandma Willis, and their family immigrated to the United States in the summer of 1952. Grandpa Debs wasn't able to work as a dentist in the United States because his dental license from Brazil wasn't recognized in California. Debs and Willis were living in Pomona, California and started working at Wheel Craft Inc. in Azusa, California very soon after they arrived in the United States. Debs worked as a machine operator and foreman from August 1952 until September 1957. But, he didn't want to work there forever. So, he got a job working as a dental technician in a lab in Pomona and worked there for almost a year. The family moved to San Francisco in 1958 and Debs was able to get a job as a dental technician there for five years. 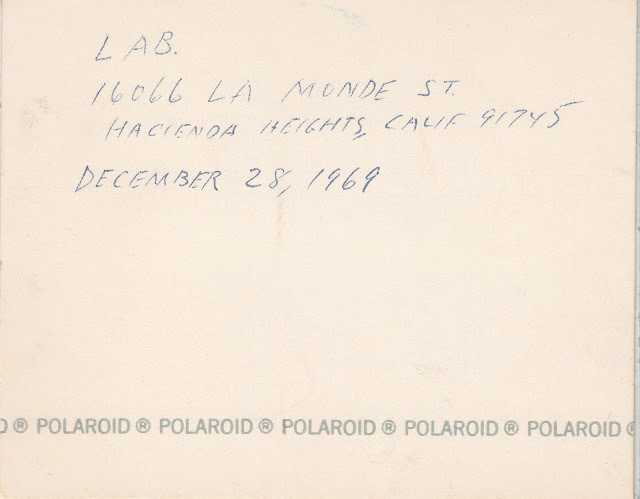 He then had his own dental laboratory from October 1963 until August 1965. He sold his laboratory and the family moved back to Pomona where he again worked as a dental technician in another lab. It must have been difficult for my grandfather, who was a practicing dentist with a college degree from Brazil, to work as a technician instead of as a dentist. Thankfully, a law was passed in California that allowed foreign dentists to apply for a California dental license. My Grandpa Debs completed a special program in General Dentistry from the UCLA School of Dentistry University Extension. I have his certificate of completion dated in 1973. My mom said that Debs (her father) went to school and worked at the same time. That must have been exhausting! I also have a copy of Debs' "Application For Examination For Licensure To Practice Dentistry." It contains wonderful information including his previous education and work experience in Brazil and in the United States. Debs became a dentist in not just one country, but two. I think that is an amazing accomplishment. 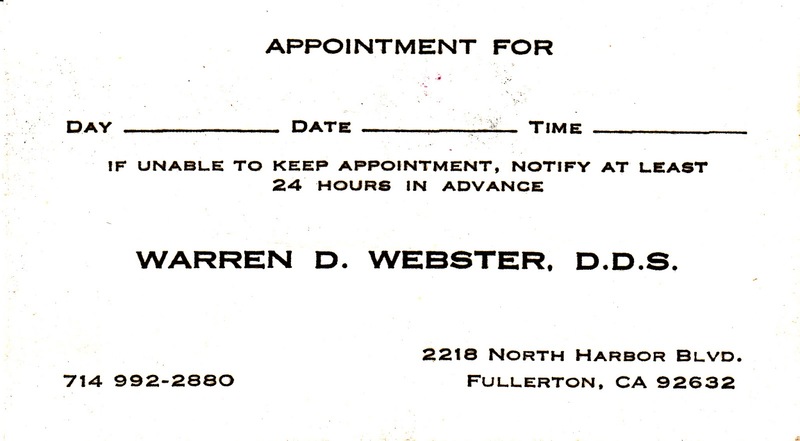 After Debs got his dental license, he opened his own dental practice in Fullerton, California. 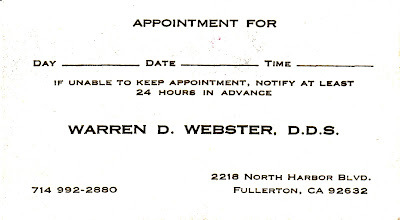 Here's one of his appointment cards. You may have noticed that his name on the card is Warren D. Webster. That's because he changed his name from Debs Warren Webster to Warren Debs Webster. Here's a photo of Grandpa Debs at his dental practice in Fullerton. 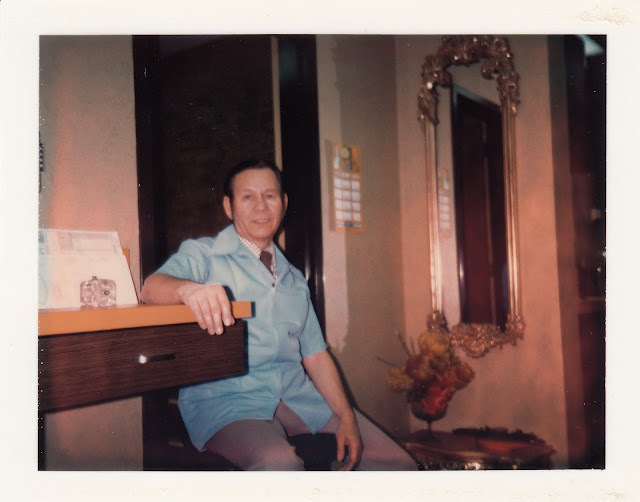 My mom told me that Grandma Willis also worked in his dental office there. Eventually, Grandpa Debs closed his dental office and worked in a dental practice with other dentists. I don't know exactly when my Grandpa Debs and Grandma Willis moved to Hacienda Heights, California. 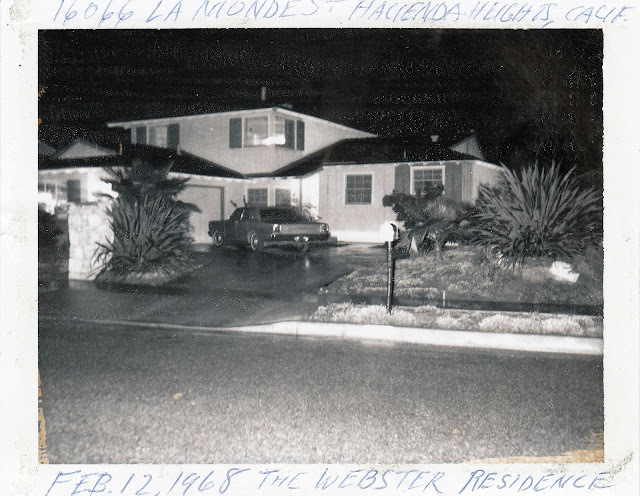 But, their beautiful home in Hacienda Heights is the home I remember my family and I visiting when I was a child. In the garage of this home, my Grandpa Debs had a dental lab. Here's a photo of his lab. Here are some close-up views of the desks in the lab. This is the back of the photo with Grandpa Debs' writing on it. 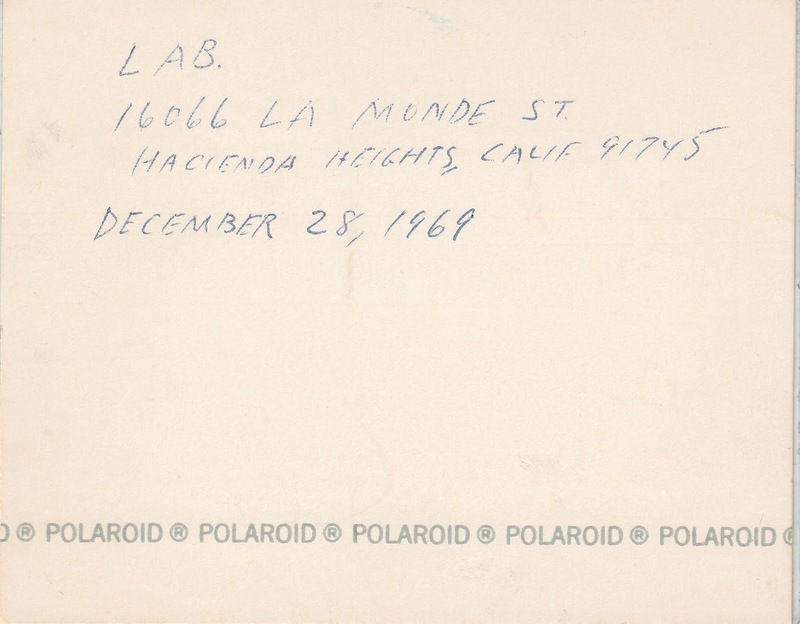 See the address of the lab? It's the same address as their home in Hacienda Heights, California. And here is a photo of their home, again with Grandpa Debs' writing on it. Thanks for strolling down memory lane with me as I've shared more about my Grandpa Debs Webster. Your grandfather seems like he was a resourceful and determined man, Jana. I agree Nancy. He was a very hard-working man. Thank you for stopping by! It is great that you have the photos of his home and his lab to add to his story. Did you call him Grandpa Debs or just Grandpa? Yes, we are so blessed to have these photos and that Grandpa wrote on them too. I did just call him Grandpa and not Grandpa Debs. Thank you so much for stopping by!